The Falmouth Dog Park opened in May 2011 and is the only dog park on the Upper Cape. It is a 1.6 acre site on town-owned land, with three fenced play areas for dogs. Approximately 3,000 square feet is divided into a "Small Dog Area" and an "Acclimation and Time Out Area". The “All Dog” area is 16, 760 sq. ft. All areas are covered with pea stones and sand and include benches, water bubblers, and waste disposal cans. Note: During the winter months, the water is turned off. Please bring water for your pets. As part of its mission to serve the entire community, the Falmouth Dog Park is handicap-accessible and includes a wheelchair-accessible picnic table. The park is operated and maintained by volunteers, and is completely funded via donations and fundraising activities. Volunteer stewards visit the park daily to ensure that it is clean and safe for people and dogs. Various fundraising and social events are held each year: a Doggie-Bowl-a-thon, a Halloween parade and party, a summer pool party, work days, and meet-and-greet days. The park is also enhanced by artwork by local artists, including a mosaic tile wall and a found-art sculpture replica of the dog park. The Park is open daily from dawn to dusk year-round and is free of charge. The driveway is paved and there are 3 handicap parking spots and additional parking for 20 cars. 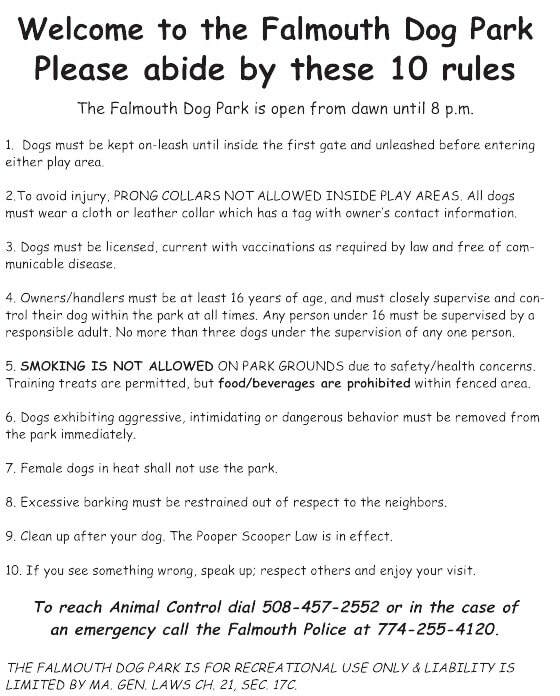 When beaches are closed to dogs, when roads are icy, when hunting season is on, and at any time of the year, the Falmouth Dog Park provides a safe and conveniently-located spot for dogs to play outdoors. The Falmouth Dog Park was built and is maintained through donations and the efforts of volunteers. Stewards visit the park daily to insure that it is a clean and safe environment for people and pets. If you would like to help, please volunteer by calling 508-331-2929.